As lovely an honor as this is, it also made me sad. And angry and frustrated. This just might be the whitest YA list ever. And that is saying something, given that children’s literature is far from diverse. A Minnesota teacher blogged about the issues this raises for all readers. Please take the time to read her post – it is important. If you are going to browse the NPR list, please also browse through the lists that are linked to over at Reading In Color. Pull all of these lists together and then you’ll have a robust resource for YA readers. This list was announced almost a week ago and it has taken me this long to process what the honor means to me and what the unbalanced representation means to me, too. You could argue that since the nominations came from NPR’s audience, and that same audience voted for the finalists, that the exclusion of authors of color reflects those voters, and is not any oversight on the part of NPR. The fact that in the commentary, the NPR writers admit they had no idea who John Green was (he has FIVE books on the list and has become a YA force of nature) is another clue that the people involved have a lot to learn about the current state of YA literature. I want to give NPR a thank-you, and also some kudos for at least acknowledging that YA literature is a genre worth paying attention to. But I’d like to challenge them to recognize the bias that they are operating with…. and to fix it. We cannot be a great nation unless and until all of our people are always seated at the table. Contact the NPR Ombudsman and share your opinion. Share your opinion with me, too. What do you think about this? Thanks for raising this important issue. I’m embarrassed to say it didn’t occur to me, although I certainly thought the list of nominees was extremely arbitrary; hundreds of other books could have been named that were just as worthy as the list I voted from. I think it’s very important that this list be considered as a list of “favorite” books, which NPR has recently started doing, switching from calling it a list of “the best books of all time,” which it certainly is not. I was happy to find 10 books I loved on the list of candidates that I was pleased to vote for. WINTERGIRLS was one of my choices! I also chose MAKE LEMONADE by Virginia Euwer Wolff, which features poor characters who might be of any race; the author deliberately did not specify skin color, so readers can imagine them any color they like. I was sad to see that Chains didn’t make the list. Maybe it was a bit young for the readers, but it would have helped. Also there was no Walter Dean Myers! How is that possible? My students love him. Hi Laurie: My friends and I had our own outrage once this list was released. I saw the list when they posted it for voting. At that time, there WERE people of color: WDM, Angela Johnson, even some Jacqueline Woodson, if I recall. That none of them made it to the final 100 is ridiculous. But, it is surprising. Many of these lists don’t give nods to people of color, of subjects of color, of anything really beyond the mainstream (read: White, middle class, straight) usually. That this list is so white simply confirms what we’ve known all along. What is problematic, too, is that people who work with children will reference this list and not ask those important questions: primarily, whose voices are missing? These books on this list don’t reflect the lives of the young people I know, for the most part. Thank you for posting how to take action. I’ll share that with my friends. I’m VERY glad to see your post on this topic. I wrote about it on Friday, asking who is the “your” in the “Your top 100” and pointing readers to the discussion of NPRs lack of diversity, but you’ve got a much broader readership than I do, so thanks for taking it up. Yesterday, I learned of an ad campaign with posters that say “In any war between the civilized man and the savage, choose the civilized man.” The next line is “Support Israel. Defeat Jihad.” The juxtaposition of “civilized” and “savage” comes right out of the portrayals of European/European Americans and Indigenous peoples of “the New World.” The ad is disgusting and should give pause to writers who use that binary and teachers who teach their works in an unchallenging way. I’m developing a blog post on the ad now. Like others here, I was happy to see Speak and many of my other favorite YA books on this list, but also dismayed at how arbitrary and lacking in diversity the list is, given its potential distribution and use. Given NPR’s influence, a vote was not the most responsible way to compile such a list. 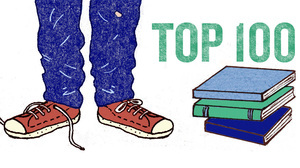 The title of the list–Top 100 YA Books–is all that most readers will take into account. They won’t all understand its intrinsic lack of credibility. Of course, reading tastes and lists in general defy objectivity, but this one’s getting way too much traction given its built-in flaws. As a writer who tries to promote literature featuring Latino/a characters and themes, I was disappointed. As a former teacher of YA writing, I almost had to laugh…so many names missing it defies common sense. I guess it’s a start, though. It was a good reminder to reread Speak! When the list, Best-Ever Teen Novels?, was published I was surprised to see debut authors on the list. Not that they aren’t worthy, but NPR said ‘Best-EVER;. Their expert panel, their words, that narrowed the list to 235 consisted of a children’s book editor from the NYT, a children’s book editor from Publishers Weekly and editor of PW Children’s Bookshelf weekly, a librarian & a person who has a YA WHY? column on the Onion. So how could the final list be so skewed. I wondered how those people were not familiar with John Green. No Graveyard Book or Chains on the list to even vote for. The voting wasn’t blocked so people could not vote multiple times. I think lists are just that, lists, and there are too many of them that eventually they have no validity. #16 Perks of Being a Wallflower is out tomorrow, reissue in Hardback. The #1 problem with all these lists, IMO, is that they’re publicized as “best ever” when what they really are is “NPR listener favorites.” I had a similar reaction when they did the “best ever” science fiction and fantasy novels a year or two ago, and hardly any women were on the list. This list seems particularly bizarre, as some of the picks are clearly children’s books and others are adult books that I don’t think many teens even like — they’re just forced to read them in school. And some of the picks — I mean, Sarah Dessen is a very good writer, but I’m not sure she’s written three of the best YA books of all time. But people vote for what they’re familiar with, and these are the books that NPR voters are familiar with. For balance, I really wish they’d publish some personal “top 25” lists by writers and librarians who have read more widely than the average reader. We’d probably see a little more balance in those. First, kudos to you for your work being included on this list. NPR is a treasured and venerable institution, and it does mean something that your work has national impact in this manner. Go, you, and all your works. That being said, this was, indeed, a disappointing list, but lists which have the word “Best” in them generally are. I agree with the above poster that if all we do is pitch popularity contests for books, those with the largest publishers, most visible authors and best PR folk will come out on top every time. People vote for that which is familiar and noised about. Polls like these need to use fewer superlatives – not good, better, best, but readers’ favorite characters this week, this author’s favorite book setting this month, or favorite stories/characters/authors of color for YA, etc. We could probably come up with 100 Best Ever that don’t belong on the 235 finalists, and add some that the ‘panel of experts’ left off. Less than one/tenth per cent of editors of publishing companies or magazines are people of color. How do you expect them to evaluate written materials from any point of view except of their cultural advantage. They don’t know other cultures and can not be expected to be diverse in a country that does not enthusiastically endorse diversity. This is another symptom of a “closed loop” problem in YA (and all) publishing. White English Language writers had the majority at some point in the far past because literally very few POC could read in English. So almost ALL books were white (writer and cast). The world changed. Diversified. But the loop (white writer, white publisher, white books ) remains closed. The NPR list is a disappointing reminder that somehow this loop must be cracked open. As someone else mentioned, in addition to the color diversity issue, I also wish more than a few of the books on NPR’s list centered around LGBTQ characters. I’m aware of eleven — if one counts the extratextually outed Albus Dumbledore — on the list that include LGBTQ characters; in only half of those, though, are they what I’d consider main characters, and, of those, only about half are intratextually out of the closet. It’s thrilling that YA was spotlighted. Calling it “Listener Favorites” might have been a good idea, but I’m not sure how you can fault NPR for the list because you don’t like their listeners’ favorites. ? Wow. Took a look at the list. I make it a habit not to talk superlatives when it comes to creative endeavors, so I will refrain from saying there are some titles that I deem “unworthy” to be on the list. Walter Dean Myers does not make sense. Not just with the issue of race, but just because he’s so good and has been around for quite some time. I was stunned to not find anything by David Almond on the list— no “Skellig” or “Kit’s Wilderness”? I suppose we cannot tell voters what to vote for. But you’re right. It’s a very non-diverse list. I hope it goes without saying that your titles featured on the list are certainly deserving. Thank you for writing about this subject, Laurie. And thank you for asking readers to contact the Office of the Ombudsman. You raised very valid concerns. We welcome your additional thoughts on the subject.